Two recent short horror films address the subject of non-Western immigration. Intentionally or not, their messages are ambiguous, even discomforting, rather than simplistic and politically correct. Short horror films from Canada tend to be comedic rather than dramatic horror, and often incorporate social or political satire. Make of it what you will, but the most politically correct films over the years have come from Canada. 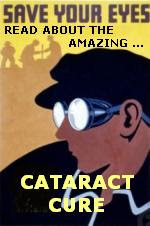 In the French Canadian Sang Papier (aka Night Crosser), the political satire focuses on the illegal influx of immigrants from non-Western cultures into the West. But what makes the film provocative, rather than heavy-handed, is that one can read multiple messages into it. Grigore (Alexand Fournier) is a Romanian vampire trying to enter Canada. But first he must get past suspicious immigration officials. (Spoilers ahead.) Grigore fails to hide his vampiric nature. Having been caught, he faces deportation. But then an immigration official reveals that she too is a vampire, having infiltrated the immigration service. She kills her human colleague to protect Grigore's secret. She turns out to be Grigore's aunt (Marika Lhoumeau)! She advises her nephew on how to suppress his bloodlust and pass for human, and thus assimilate into Canadian society. How to interpret Sang Papier? One can come away thinking that Trump is correct. (The nationalist or populist position.) The West is being infiltrated by dangerous foreigners. By vampires who form secret networks within our governments and undermine our laws. Vampires who can and do murder humans. Or perhaps the message is that non-Western immigrants, though they might look odd, are harmless if unthreatened, family oriented, and desire only to assimilate. (The progressive or libertarian position.) Grigore comes across as timid and inept, rather than savage. He is fond of his aunt. Had he not been discovered, his aunt would not have killed her colleague. She did try to dissuade him from pursuing Grigore's shady background. One can even come away thinking that immigrants should want to assimilate. (A traditionalist, non-multicultural position.) That the aunt's advice on how Grigore can suppress his bloodlust, and his desire to do so, indicates that he will be a good Canadian citizen, and thus justifies granting him entry. Sang Papier supports all positions, depending on how one interprets the film. The Kind Ones is another short film about the perils of non-Western immigration. As in Sang Papier, the immigrants are East European. In this case, a married couple who've taken in an American foster son, Timothy (Taishi Hosokawa). Although Mr. and Mrs. Byleth (Brandon deSpain, Gjilberta Lucaj) now live in America, they are raising Timothy according to their old country traditions. This includes beating the boy as a means of education. This doesn't go over well with Timothy's teacher, Mrs. Andrews (Angela Trotter), who confronts the Byleths. The father explains that "Our culture is different from yours." Mrs. Andrews retorts "I don't care what your culture is. In this country, in America, our children's safety comes first." Demanding that immigrants assimilate to American culture is a position generally associated with the political right. The Kind Ones is interesting in that Mrs. Andrews argues for assimilation from a progressive perspective. She embraces multiculturalism in that she teaches about Kwanzaa in class. But patriarchy is one cultural artifact that immigrants must ditch. They can keep their holidays. But no traditions that support violence against women or children. Of course, the Byleths are not as they appear. No, they're not vampires. Closer to werewolves. And unlike the vampires in Sang Papier, these werewolves have no wish to assimilate. In the end, it's the American Timothy who adopts his foster parents' cultural and culinary traditions -- much to Mrs. Andrew's final regret. Earlier, Timothy tells Mrs. Andrews, "You're a kind woman," adding, "My parents like the kind ones." Well, of course. Werewolves appreciate easy prey. The Kind Ones offers some discomforting observations about immigration. That while progressives generally welcome immigrants, immigrants don't necessarily welcome progressive values. And that some immigrants, far from assimilating into the host culture, will instead spread their foreign customs into the native population. Sang Papier and The Kind Ones are both currently doing the film festival circuit. For more information on interpreting horror films, see Horror Film Aesthetics: Creating the Visual Language of Fear. This blog represents a continuing discussion of my views on horror, picking up from where the book left off. British actress Lysette Anthony has announced that she too was raped by producer Harvey Weinstein. British actress Lysette Anthony has told police that Harvey Weinstein raped her, the Sunday Times reported, becoming the fifth woman to level such accusations against the disgraced Hollywood mogul. The 54-year-old actress, who currently appears in British soap Hollyoaks, told Metropolitan Police last week that she had originally met Weinstein in New York, and agreed to meet him later at his rented house in London, according to the paper. "The next thing I knew he was half undressed and he grabbed me. It was the last thing I expected and I fled," she told the Times. Anthony, who appeared in Woody Allen's 1992 film "Husbands and Wives", said that Weinstein then began stalking her, turning up unannounced at her house. "He pushed me inside and rammed me against the coat rack," she said of the attack in the 1980s. "He was trying to kiss me and shove inside me. Finally I just gave up." Anthony first came to my attention when she played Angeliqué Bouchard in the short-lived 1991 Dark Shadows remake. While Anthony is not especially known as a scream queen, her extensive body of work (she has 89 acting credits on IMDB) does include many horror films and TV shows. My favorite horror work by Anthony is Trilogy of Terror II (1996), in which she played the lead role in all three tales of that horror anthology sequel. This was in the tradition of Karen Black playing the lead in all three of the original Trilogy of Terror's stories. The original is justly considered a horror classic and Black's performance was a tough act to follow. But while the remake is little remembered, Anthony's performance was a worthy successor to Black's. Especially in "Bobby" (the middle story), wherein Anthony plays a mother who turns to witchcraft in an attempt to resurrect her dead son. By all means, watch it. Horror is a tight-knit community, composed of passionate fans. Although all of Weinstein's victims should be supported, reading about Anthony felt personal, as though "one of our own" was attacked. Let's hope Anthony and the other women find peace and justice. 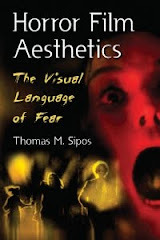 For more information about acting in horror films, see Horror Film Aesthetics: Creating the Visual Language of Fear. This blog represents a continuing discussion of my views on horror, picking up from where the book left off. Mysterious Forest: The Witch is one of the most original, and weirdest, short horror films I've seen this year. It's noteworthy for its oddness. Is this an oversight on filmmaker Jaroslaw Gogolin's part? With Mysterious Forest: The Witch, it's hard to distinguish the bad from the brilliant. The girl and witch pause after every line. It's what bad actors sometimes do. Yet here their constant pauses contribute to the film's feeling of weirdness. Then there's the girl's slow reaction to the witch garnishing her with herbs. 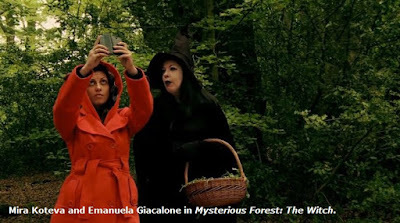 Still studying her cell phone, the girl slowly notices the witch is sprinkling herbs upon her red coat. Most people would have instantly snapped at the witch. Maybe even smacked her. The girl only responds with a "What is this?" and a testy "I don't like this. I don't like any vegetables." Also weird is the witch's heavy white pancake makeup, with black Goth lipstick and eyeliner. It's too much. She looks like a freak, to us and to the girl, but that's likely intentional. Then there's the witch's strange accent and exaggerated lip smacking. In another context it would be scenery chewing. Here it all somehow works. Amid this strangeness, there is also beauty. Colors are deeply saturated. The forest is very lush and green. The girl's coat very red. Appropriate hues for the film's storybook conceit. The ominous music injects menace into the story, such that the witch's weirdness appears creepy rather than comedic. Despite the witch's difficulties navigating our modern world, we fear for the girl. Mysterious Forest: The Witch depicts witches not as supernatural monsters, nor as wise women healers, but as child predators. Mysterious Forest: The Witch is a vignette from an intended Mysterious Forest feature. I found two other Mysterious Forest vignettes on YouTube (different actors, different stories) and they don't rise to the level of The Witch, lacking its originality, production values, and overall weirdness. It seems that Gogolin is learning and improving his craft as he proceeds with filming. It will be interesting to see the final feature. For more information about weird or unusual horror films, see Horror Film Aesthetics: Creating the Visual Language of Fear. This blog represents a continuing discussion of my views on horror, picking up from where the book left off.